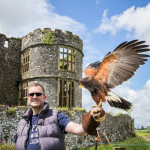 Over May bank holiday the National Parks commissioned me to head down to Carew Castle and cover there fantastic open weekend which they had put on. The re-enactment group Bowlore put on a very entertaining professional and fun show. Here are few of the photographs from the day. Enjoy.